One of the many subtle changes to iOS Mail app in modern versions is how marking emails works in the Mail app. 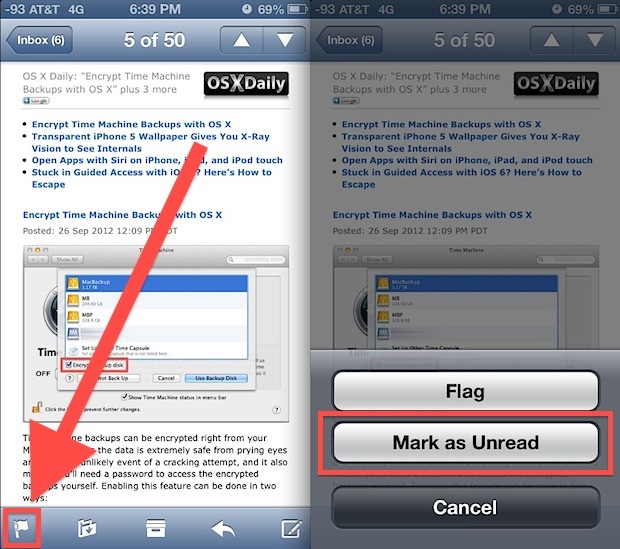 The latest versions of Mail for iPhone and iPad now tuck the Mark as Unread option into a flag menu, which resides in the toolbar of an active email message. When the message has been marked as ‘unread’ again, it will have the little blue dot next to the message in Mail app inbox as it did before it was read. 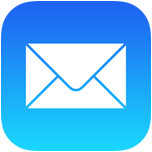 Super fast and very easy, it works exactly the same in Mail app for any iOS device regardless of hardware or version running on iPhone, iPad, or iPod touch. It doesn’t matter what version of iOS you’re running this feature will work as long as it’s slightly modern, it has been around from iOS 6 onward well through to iOS 9+ and surely beyond. 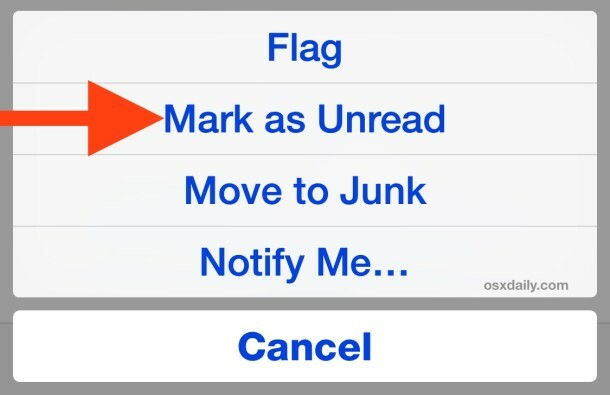 Do note that the latest versions of iOS Mail also include a handy gesture for marking messages as unread (or read). Once you get used to it, the change is for the better since the toolbar stays visible all the time, whereas before you had to navigate back to the top of an email to mark it as unread. Nonetheless, the minor change has caused a fair amount of confusion, and a lot of people seem to rely on this in order to later address emails that are important. I know I use the feature constantly for that purpose as a way to filter out the email onslaught from what matters and what doesn’t, and if I’m surrounded by people who couldn’t find Mark as Unread than certainly others are in the same shoes too. Currently there does not appear to be way of marking multiple messages as unread, though a group of emails can be marked read just the same as before. Yet another unnecessary change that is confusing people. The worst is if you accidentally hit that stupid box icon, your email messages disappear and I still have no idea where they go or how to find them. This way if you hit the “box” button by mistake the device will ask for confirmation before deleting or archiving the emails. To mark a bunch of emails as unread is the same as always!! And I think this a very handy and useful change. It improves my email-viewing a lot. But still no way to save nor store emails on my iPad. Sigh. If an emails are marked read, I hit Edit in the mail list and tag them and hit “mark”. I get the option to mark them all unread. My main objection is that it’s so easy to accidentally mark them as read in the first place. If I delete a spam email, for example, the next email is selected and is automatically marked read, even though I haven’t looked at it yet.